It’s easy to see why white rice is so popular: it’s cheaper, it cooks faster and is fluffier than brown rice. Unfortunately, this means that people lose the benefits of brown rice, a real energy source that actually has twice the fiber than white rice. In this post we’ll go over several brown rice recipes you can add to your dishes. Brown rice is not only great for your body nutritionally, but also acts as a powerful cleaner with a similar effect of psyllium husk. This is a fiber cleaning 7 days easy to follow. Why does brown rice have more fiber than white rice? The key is the way it’s produced. The rice milling process only removes the sheath (outer layer), which is not edible. The rest of the grain remains intact. In contrast, rice production involves grinding to remove the bran and most of the germ layer. This additional processing destroys most vitamins, minerals and fiber content in the grain. White rice also has a pretty high glycemic index, which can increase the level of sugar in the blood and contribute to weight gain. 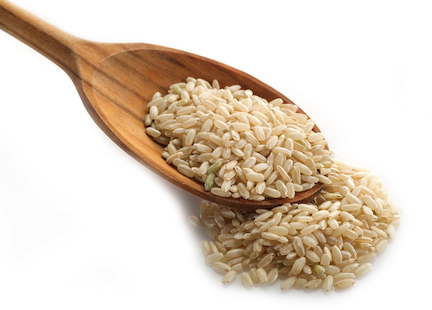 In contrast, the grain brown rice contains vitamin B and minerals such as magnesium and selenium. If your diet is comprised mostly of brown rice, you will want to pair it with other foods for a complete protein source. Beans, when paired with rice, provide a complete protein. For example, brown rice with red beans provide about 10 g of protein per serving. If you cannot eat beans due to digestive issues or a food allergy, then another option is pairing your rice with BCAAs (branch chain amino acids) for a complete amino acid profile. Why is brown rice an incomplete source of protein? Rice does not provide all of the amino acids required for healthy living. Soak the brown rice for at least 25 or 30 minutes, or overnight if possible, so that the bran layer on the grain is smooth. The diet of brown rice diet is high in fiber and has considerable flexibility regarding what you can eat while you stick to fruits, vegetables and brown rice to lose weight. There are no specific restrictions on the size of the portions, but try to eat until you’re 80% full. Chewing slowly helps and allows your body time to tell you when you’re full. Herbs and spices such as garlic, chili, cilantro, ginger, barley and onion. A small amount of extra virgin olive oil or linseed oil you can use on vegetables or brown rice diet. Fresh juice, lemon tea with ginger, fresh mint tea and decaffeinated herbal teas. Fresh vegetables, except corn and mushrooms. You can eat them raw, lightly steamed or baked. Frozen or canned foods are prohibited. Cook rice, then toss with the tomatoes, chopped apple and celery in a large bowl. Squeeze the lemon and add salt to taste. Cook rice to the label instructions. Mix all ingredients, season to taste and serve in a shallow dish. This provides enough for two servings.